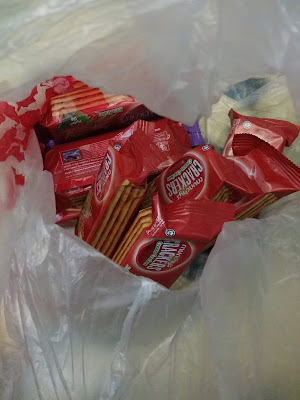 My husband brought these home yesterday; the office cafeteria is closing temporarily for Ramadan so they gave away these crackers. Mum upon seeing it, gave me a very meaningful look and laughed her heart out. "HAHAHA! Macam kau jugak Tiah, tapi ni up sikitla- cafe..."
I was almost laughing. Heh. Not sure what she was refering to. Ooh.... Yes. It was a sad story la. "Teruk betul kan... Biskut je pun"
"Dah tak mampu masa tu, nak buat macamana.."
Thank you Allah for always reminding me of the past to make me thankful with what I have now. It's not that I have much, but at least now I have more than what I used to have.